Venset products are sold worldwide via a trade network of distributors and resellers. Support is available to all trade customers. Before contacting us, please, have the following information ready. Otherwise, we will not be able to help you properly. 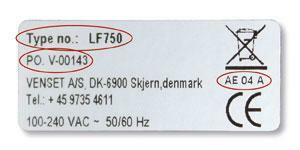 You will find the information needed on the label placed nearby the motor on your VENSET product. VENSET will also be at your service if you need any other information. Downloads: data sheets, mounting inctructions, movies, presentations etc.